The Simple Life is a tiny little website with very beautiful things! Language: Site is in Japanese with some English translations. 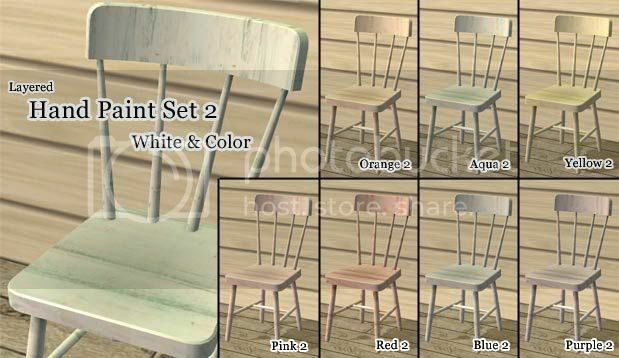 Buy Mode: Many Maxis objects recolored to look worn, painted, or metal. Recolors of other CC makers objects, including many tablecloth covers. Build Mode: Some Maxis door & window sets recolored to look painted and homey. Similar recolors of CC artists window meshes as well. Clothing: One Teen Male t-shirt set and recolors of the loin cloth mesh. Make-up: Make-up sets and facial sculpting/ highlighting sets. Full-face makeup: Facial hair for men, wrinkles for elders, "looking around" contact lenses. Facial hair: Many facial hair recolors. Eyes: Two large eye sets. Several sets available at Easter Egg forum; click the pics to get the download.